Biography of Dutch Realist Painter, Leiden School. One of the most technically accomplished of Old Masters of 17th century Dutch painting, Metsu was born at Leiden, about 1630, received his first training from Gerard Dou, whose sleek and minute manner he soon transformed into a finer one of his own. He also paid close attention to the works of other contemporaries. The example of Frans Hals, Jan Steen, Rembrandt and Nicolaes Maes served to educate him in finer tonalities, in discreet brilliancy of handling, in bringing colour into the "dark manner" in which he began. As a result he created some of the greatest genre paintings of the period. In 1648 he is inscribed among the founders of the painters' guild. In 1655 he moved to the richer patronage of Amsterdam, where two years later he married. A wonderful exponent of Protestant Reformation art, Metsu died under the hands of an unlucky or unskillful surgeon in 1667, not yet forty. In his young manhood he painted a number of Biblical subjects somewhat in the disorderly manner of the former Leidener, Jan Steen, and perhaps encouraged by Rembrandt's early success with such themes. But Metsu lacked the imagination which alone gives such subjects significance, as may be proved from the very Steen-like Prodigal Son among the Harlots, at the Hermitage. Also quite early are his pictures of Blacksmith Shops. Oddly, these pictures of honest toil are unique in Dutch genre style oil painting. They imply a careful study of Rembrandt's admirable interiors, and Metsu has caught much of Rembrandt's magic in making the prevailing dusk a means of revelation and expression. At thirty, in Amsterdam, he strikes his gait, and becomes the celebrator of the comfortable and dignified domesticity of the prosperous families. meaning of art, see: What is Art? Entirely typical is his Market Scene, in which a fine old lady in a nunlike costume bargains for a chicken while a disheveled and disinterested old gentleman seated on a cask smokes seriously, and a spaniel registers interest in the transaction. Finer and more broadly conceived is the more populous Vegetable Market, with its shadowing tree and picturesque background of old gabled houses beyond a canal - a pleasant episode in the ritual of housekeeping fully understood and expressed. Perhaps the best of these pictures on the subject of marketing is the one in the Louvre. The sheer animation, the sheer pleasantness of it are captivating, and its pleasantness depends as much on fine selection and arrangement and sensitive study of the lighting as it does on sympathetic understanding. More concentrated and more tenderly painted is the figurative painting - Young Girl peeling Apples. The act is accomplished with automatic grace, while the fair worker smiles inwardly over such culinary resources as a basket of big apples and a sizable unskinned carcass of a large hare on the ledge before her. The richest of Metsu's paintings in compositional pattern is the Music Lesson. It is uncommonly bright in colour, the seriousness of giving and receiving instruction is well realized, while the contrast of the arabesque contours of the figures with the ingeniously interlocking rectangles of the spinet, picture and pavement is an admirable example of the quintessential Dutch Realist style of genre painting. Aside from this, all the forms are massively asserted, but pictorially, without crowding and without mere bulginess. Unlike Jan Steen and Gerard Terborch, Metsu approaches the social scene descriptively, approvingly, and without a suspicion of satire. Thus the Morning Visit, where an assiduous officer courteously looks down on a richly dressed young girl seated and holding a glass of wine, is a pure Terborch subject, but there is no hint of solicitation that goes beyond civility. The most elaborate Metsu of this aristocratic kind is the Visit to the Nursery. The reds and golds against the general brown are sumptuous - sharp, yet harmonious. The various moods of the proud parents, of the attentive or merely curious servants, of the demonstrative fine lady making the visit, are sensitively recorded without undue emphasis. The relations of the figure group to the large architectural rectangles, details tactfully suppressed, are entirely just and exquisite. Such a passage as the lights and darks and swaying contours of the maid against the bright rectangle of the door at the left might serve as a lesson in beautiful design. 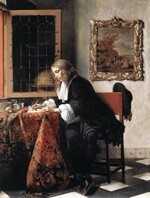 Such a picture suggests that if Metsu had lived on into his sixties he might have challenged the laurels of Jan Vermeer. Of such aristocratic Metsus none is more engaging than the Intrusion. However eager, the intruding gallant is harmless enough and, except for the faithful terrier, he has the sympathy of all concerned. The odd V-shaped composition and the bold plotting of the white areas are very original and effective. Undoubtedly the most popular example of Metsu's Dutch Realism is the painting Sick Child. In its overt and irresistible pathos it recalls the best works of Nicolaes Maes, but it is finer, more thoughtfully composed, less insistent. How incapable Metsu is of indulging satire, or even of poking fun at his creations, is shown in his single doctor picture, the Sick Lady, which may be profitably compared with the superficially very similar masterpieces of Jan Steen. Unlike Steen, who finds satirical comedy in the situation, Metsu accepts and respects everybody concerned. The exhausted patient does nothing to attract the doctor, he, doing his level best with a urine glass, pays no attention to her, the old servant awaits the diagnosis with natural concern. The composition is one of the densest and finest from Metsu's hand, the severe geometry being tastefully varied and attenuated, and the whole effect singularly lucid, massive and dignified. It should be clear that while the bonhomie of Metsu may seem his leading characteristic, it is by no means the whole of him. It is expressed through a masterly handling of his materials, and reinforced by penetrating observation and fine selection. With such capacities there can be, despite the radical doctrinaires of today, a very fine artistry which includes no criticism of life. Works by Gabriel Metsu can be seen in the best art museums across Europe.